There is no barcode on this release, instead there is a white rectangular area printed over the location of where it should be, along with some text written in Bulgarian along with the APA logo. There is however the printed number under this, so I’ve assumed that this is the correct barcode for this item. © 1998 Mushroom Records (UK) LTD.
Ⓟ 1998 Mushroom Records (UK) LTD. 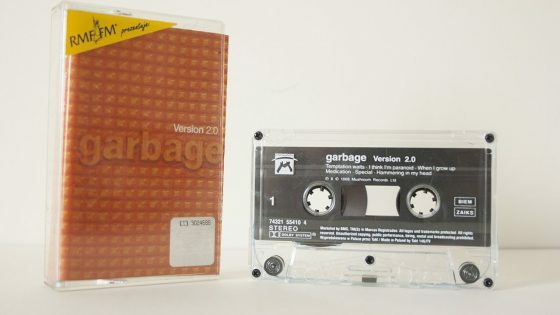 Cassette, 12 tracks (Temptation Waits / I Think I’m Paranoid / When I Grow Up / Medication / Special / Hammering In My Head / Push It / The Trick Is To Keep Breathing / Dumb / Sleep Together / Wicked Ways / You Look So Fine) in plain case. Cassette, 12 tracks (Temptation Waits / I Think I’m Paranoid / When I Grow Up / Medication / Special / Hammering In My Head / Push It / The Trick Is To Keep Breathing / Dumb / Sleep Together / Wicked Ways / You Look So Fine) in normal case.